Looking for an easy pork recipe that doesn’t take forever to make while still being flavorful and juicy? Check out this full-of-fall-flavor Roasted Pork Tenderloin with Balsamic Apple Butter Glaze Recipe! 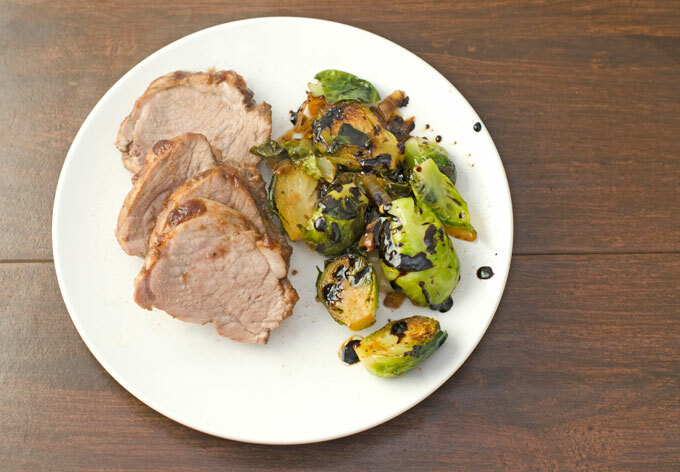 This roasted pork tenderloin pairs really well with bacon brussels sprouts drizzled with a balsamic butter sauce – recipe coming soon! I’m so happy that it’s starting to actually feel like fall outside. It’s honestly kind of weird to enjoy some of my favorite fall flavors while it’s still warm enough to wear shorts and flip flops outside. Warm spices and pumpkin are some of the flavors at the top of my list this time of year, but right now I’m really loving all things apple. I’m honestly not a huge fan of having a lot of fruit flavor added into meat dishes, but I have always really enjoyed having apples with pork, such as applesauce or apples in the stuffing. So, when Smithfield asked if I would try their All Natural Pork, I couldn’t resist buying some of their beautiful pork tenderloins that I saw when I was at Walmart to pair with some apple flavor. I wanted a really simple recipe for the weeknights, but that had a nice flavor without being overly fruity or sweet. 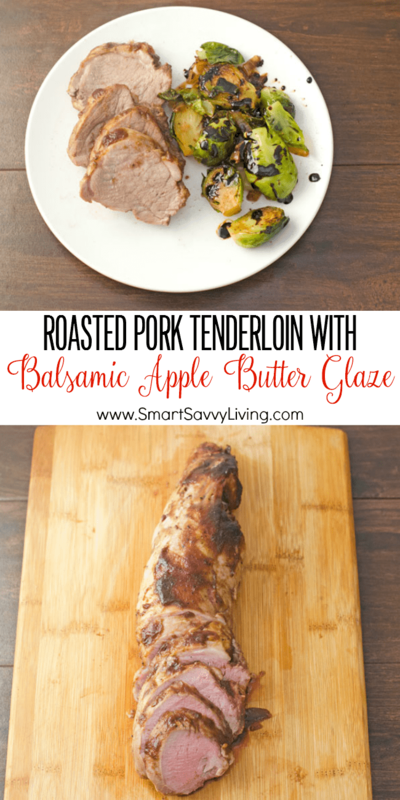 As such, I decided on this Roasted Pork Tenderloin with Balsamic Apple Butter Glaze Recipe. This pork tenderloin recipe is as easy as slathering the tenderloin in a few ingredients before roasting in the oven. Apple butter is similar to applesauce in texture, but apple butter has a bit richer and deeper flavor. Apple butter is usually cooked down a lot longer than applesauce and has more spices added, thus the richer flavor and darker color. Pairing the apple butter with balsamic vinegar helps to cut the sweetness and I love balsamic vinegar so much I often look for new dishes I can add it to. We really like eating pork because it is an affordable meat that generally has good flavor without having to add a lot of ingredients to it. 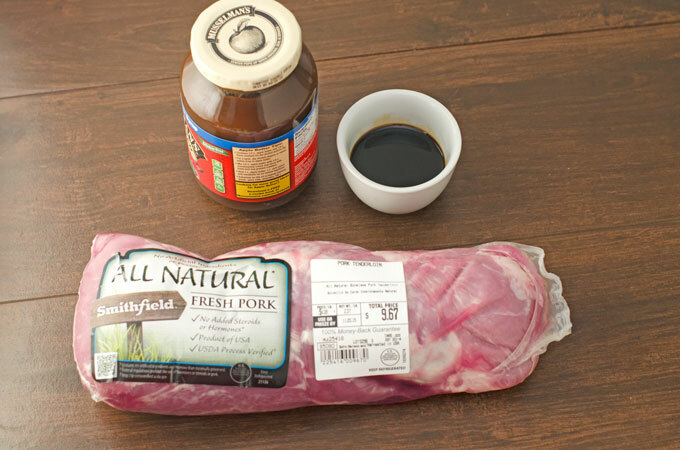 Smithfield has always been our favorite brand for pork and I always feel a bit of a sense of pride buying the Smithfield brand since the founding city of Smithfield is actually right here in Hampton Roads. 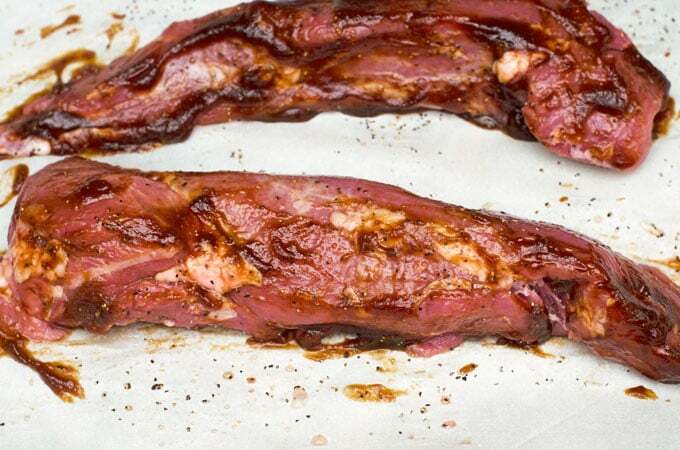 This may look like a BBQ pork tenderloin, but it’s actually full of delicious fall flavor. As we try to eat mostly all natural products, I was really happy to hear about Smithfield All Natural Fresh Pork. This is pork that has been raised in the USA, meeting the USA Process Verified standards, without ever adding steroids or hormones, nor artificial ingredients, to their products. Needless to say, I’m pretty darn proud to use Smithfield pork to make this roasted pork tenderloin recipe. The tenderloin is cut of meat that cooks rather quickly, making it perfect for those nights you need to get dinner on the table fast. I especially like this recipe because it takes so few ingredients and takes just a couple minutes to prep. Plus, it also looks pretty darn fancy sliced pretty on a platter that I’d serve to guests at a special dinner party in a heartbeat. Here’s how I put it together. 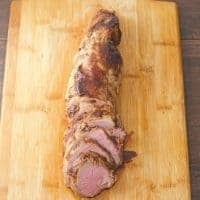 If you’ve stayed away from pork tenderloin in the past because it always got overcooked, newer guidelines have reduced the recommended cooking temperature to 145°F (previously 160), which results in a slightly pink and juicy medium-rare. Line a 9 x 13 or half sheet baking pan with parchment paper or foil, or spray with non-stick spray. In a small bowl, thoroughly mix together apple butter and balsamic vinegar. Set aside. Open package of pork, rinse tenderloins, and pat dry. Season all sides of pork with salt and pepper as desired. 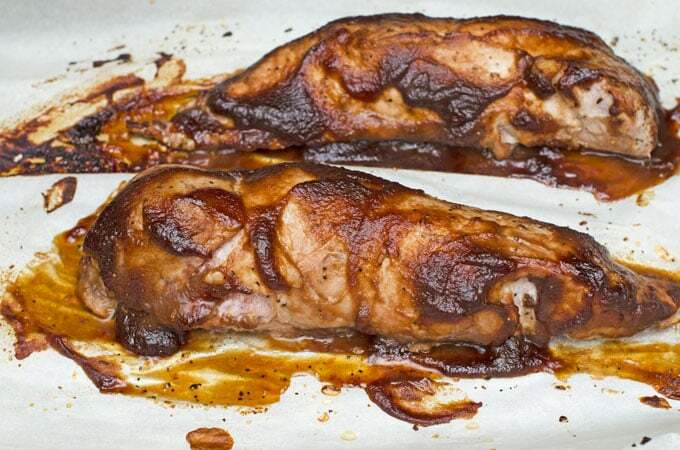 Brush or spoon balsamic apple butter glaze over all sides of the pork, trying to glaze them as evenly as possible. Keep about 4 tablespoons set aside to baste with later. Keep the fattier side of the pork up so it can self-baste while cooking. Place pork in the oven and roast for 25 - 35 minutes, depending on the size of the tenderloins, or until they have an internal temperature of at least 145°F. About halfway through cooking, baste pork with remaining glaze. Remove pork from oven, loosely cover in foil, and let rest for at least 5 minutes before slicing to allow juices to settle. If needed, spread glaze evenly over the pork before slicing. Cut into even slices and serve with additional glaze if desired. Remember that when roasting meat, it will continue to cook a couple of minutes after being removed from the oven. 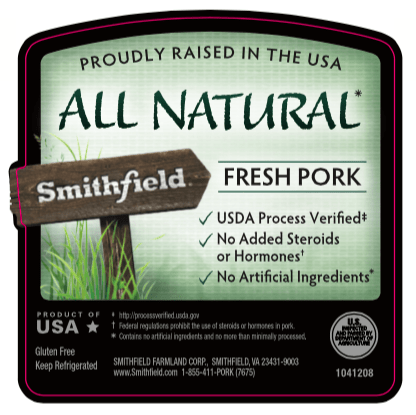 For more information about Smithfield All Natural Pork, visit their website, or follow Smithfield on Facebook and Twitter. Oh my gosh! I made this tonight and it was delish! 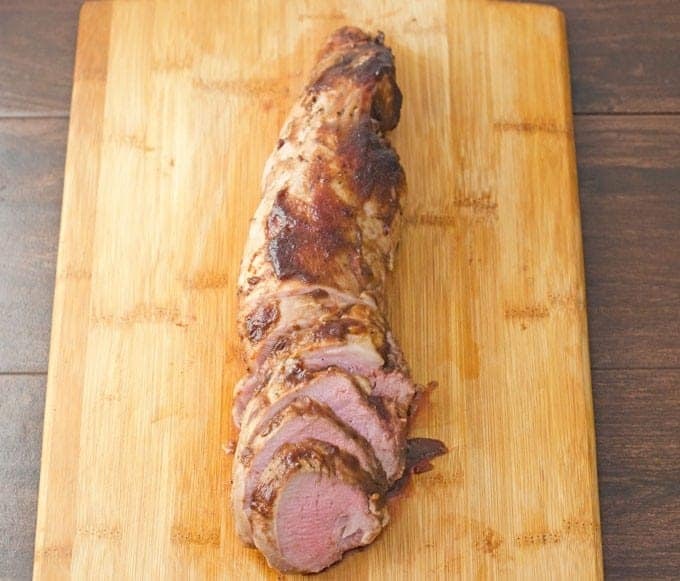 I have never been able to cook pork tenderloin and not have it turn out dry….not tonight! It was perfect. I’m just down 64 in Richmond- I used apple butter from Graves Mountain Lodge- soooo good! thank you for sharing this great recipe! Thanks for trying my recipe and letting me know how it turned out. Glad you enjoyed it. So cool you were able to use local apple butter!